Dream Theater is an American progressive metal band formed in 1985 under the name Majesty by John Petrucci, John Myung, and Mike Portnoy while they attended Berklee College of Music in Massachusetts. They subsequently dropped out of their studies to further concentrate on the band that would ultimately become Dream Theater. 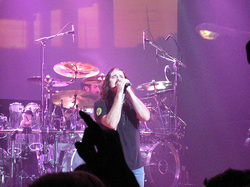 Though a number of lineup changes followed, the three original members remained together along with James LaBrie and Jordan Rudess until September 8, 2010 when Portnoy left the band. In October 2010, the band held auditions for Portnoy's replacement drummer. Mike Mangini was announced as the new permanent drummer on April 29, 2011. He is currently in the studio with the band, working on a new album. The band is well known for the technical proficiency of its instrumentalists, who have won many awards from music instruction magazines. The first part of their career happened in the late 1980s, with singer Charlie Dominici, with whom the band recorded one album – When Dream and Day Unite. After this, Dominici split amicably with the band and was until recently away from the music business. The core line-up at this point was John Petrucci, John Myung, Mike Portnoy and Kevin Moore. For their next album, the band was joined by James LaBrie on vocals, who seemed a better match for the band. This line-up recorded what is sometimes considered their best two albums before keyboard player Kevin Moore decided to depart. Moore was replaced by Derek Sherinian, who was never considered a s a full-time replacement. Still, Sherinian left his imprint on the band’s music and recorded two albums with them before being replaced by Jordan Rudess. The time with Rudess marked the most stable period in the band’s history and things remained unchanged until Mike Portnoy requested that the band go on a hiatus. The rest of the members declined this possibility and so Portnoy decided to leave. In 2011, Dream Theater found a new drummer in Mike Magnini, after a series of auditions, all of which were shown on youtube in a clever marketing scheme by the band. 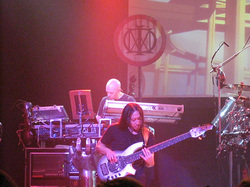 Dream Theater was one of the first bands to play so-called progressive rock. They influenced many bands that came later. Their music is highly technical and involves quick meter and tempo changes, weird time signatures and counterpoints. They are some of the most accomplished musicians out there. 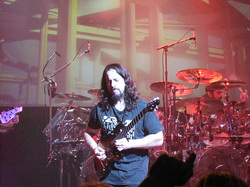 Dream Theater started getting attention from the public eye around the time they released their second album (Images and Words). They had a video for “Pull Me Under”, which got quite a bit of airplay. From then on, they just kept getting more and more successful, influencing countless young musicians and proving to be somewhat of a benchmark for technical ability. Their success, we must assume, stems from their amazing playing talents because their music could hardly be classified as melodic and easy listening. The same reason that Dream Theater get so many fans is the reason for some of the criticism towards them. Many believe they rely too much on their technical ability and pay way too little attention to the actual flow of music. Many of their latest albums have been called the epitome of self-indulgence and it is also often said that Dream Theater have been releasing pretty much the same album ever since Metropolis, regurgitating the same old tired formula. But if it works, why fix it?